ABC Family has cancelled Ravenswood after one short season of 10 episodes. Though Pretty Little Liars is the cable channel’s biggest scripted series, the spin-off just never caught on. Ravenswood follows a group of five young strangers who find their lives intertwined thanks to a deadly curse in a small Pennsylvania town. The cast includes Tyler Blackburn, Nicole Anderson, Britne Oldford, Brett Dier, Merritt Patterson, and Steven Cabral. Debuting in late October, Ravenswood’s first episode drew a healthy 2.12 million viewers. However, many viewers must not have liked what they saw because only half as many tuned in for the second episode. The cable channel tried to give the series a fighting chance by putting it on hiatus over the holidays and then by pairing it with Liars. That gave the show an initial boost but viewers fled once again the following week. The 10 episode season ended up averaging 1.29 million viewers. 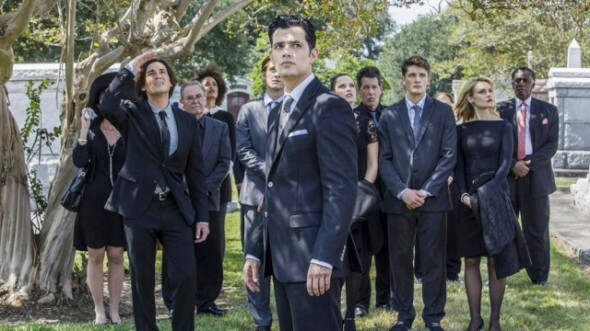 The defacto series finale aired on February 4th. What do you think? Did you like Ravenswood? Are you sorry there won’t be a second season? More about: Pretty Little Liars, Ravenswood, Ravenswood: canceled or renewed? Ravenswood: New ABC Family Drama; Cancel or Keep It? I never knew ravenswood existed till I watched pretty little liars on Netflix. I bet if they tried one more time with this series since PLL is ending it would take off. So many questions. Yes in PLL we find out what happens with celeb and he lives obviously but still a lot of questions! Although I didn’t watch Season 1 when it first aired on tv. While watching Season 1, I was glued to my tv the whole time. Oh, please. Oh, please make a Season 2, Season 3, etc. etc. We need to know what happened to the 5 pact. i never knew ravenswood existed untill today !!! and always wanted to know what happened there!! and am very dissappointed can not find it anywhere to watch or even buy dvds!! i want to know what happens !!!! I wish they continue ravenswood it was very exciting and nice story i really loved it , please try to make it on air , and continue this series ! Please !! !